The idea for this post is courtesy of Arianne of Glitter Geek, who is visiting NYC in a month and wanted to plan out her beauty shopping route beforehand. I was already making a list of shops we have to visit in her short three day stay, and thought I might as well chronicle it here in case someone needed it in the future. First, and how do I say this without being all disclaim-y? I'm not an expert in New Yorkness. I've logged in less than a year's worth of living in NYC (though I will be living there), but the aim is to start a list that hopefully will grow through time, whether through experience or your input. Thus, feel free to suggest additions to the list in the comments! *I don't list every brand each store carries, just because that would make the list too tedious. I try to include only the less conventional brands/brands you can find only at that store. Did you think it would be anything else? Besides housing one of my favorite beauty brands ever, their window displays are always a treat to behold. The beauty level of Barney's is smaller than I thought it would be for a luxury department store, but houses some ultra-exclusive lines. 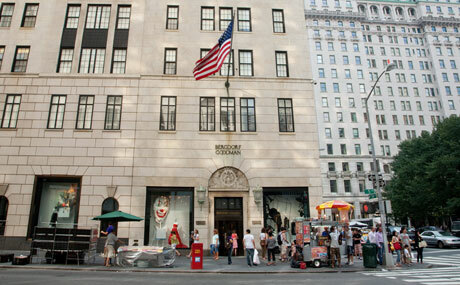 The Bloomingdale's beauty department is worth visiting because aside from being quite large, it houses Space NK. Huge beauty level surrounded by beautiful bags. While there are almost as many Sephora locations as Starbucks outlets in NYC, the Sephora at Meatpacking is unique because it stocks more obscure brands. That said, unless you're in the neighborhood, I don't think a specific trip is necessary since those brands are available in the department stores listed above. A couple years ago, Duane Reade committed to expanding its beauty section. A few of them even has beauty bars with brow shaping services. *When I find a particular DR that demands shouting about I'll update this with a specific address. This store is huge, as befits the first ever Kiehl's store (originally a homeopathic pharmacy). Three words: custom blended foundations. For exclusive collections. I believe they still have the SoHo de Chanel Blush on display. Houses the original bottle of Benetint and is possibly the cheeriest makeup store in the city. Self-explanatory. Worth noting: There are a few Marc Jacob-related stores in the vicinity, and more importantly, a Magnolia bakery just a couple stores away. I hope this helps first-time visitors get a sense of what's available makeup-wise in New York City. Remember, if you have a unique store you think would be a great addition to the list, please let us know in the comments! Perfect! I'm from Germany and in october I will be in NYC for one week. Your post is already printed! Thanks a lot! Thank you for this! Oh, how I wish I had this list when I visited New York back in April. I hit up the major department stores, but completely forgot and/or didn't know about all the boutique stores. This will come in handy the next time I visit! You are amaaaaazing! Thank you. I know it will be helpful for most people as well. Let's go EVERYWHERE. Hahaha who cares about the company I'm bringing to NYC. Just... half kidding. I want a custom blended MUFE foundation! Do they custom blend any formula? And Macy's! yeah, yeah, most people think Macy's is like the US equivalent of The Bay but the Macy's in Herald Square is pretty awesome, they even have an Inglot counter if you can't make it to the Time Square one (or for those who prefer to avoid Time Square like the plague). There is also a really nice Duane Reade on Wall Street that has a beauty section akin to the Shopper's Drug Marts in Canada. Rite Aid for cheapest price on drugstore brands! I would also add that the Alcone shop near Times Square is also worth checking out, since they stock more pro brands and stuff like z-palettes and the like. It's also worth noting that there is a Inglot in Chelsea, a short walk from the Meatpacking Sephora. I find this location more convenient than the department stores if you're based downtown or on the Westside. That being said, the department stores are definitely worth visiting if you're in the city as a tourist. Also, I am not a huge MAC fan, but the MAC Pro store is worth checking out! If I remember correctly, it's not open on Sundays, though. I believe that Edward Bess is carried at the Sephora in Union Square only. To add on to the previous comment, the Sephora at Union Square was recently remodeled and now has brands like Armani, Ko Gen Doh, Edward Bess, etc. It's quite large.. Some Duane Reades has something called the "Look Boutique" inside, which contains brands like Becca and Pixi. There's one around Grand Central station that definitely has Becca. Like productdoctor said, Henri Bendel has some hard to find brands as well. Youngblood is definitely worth checking out. ALSO! Henri Bendel has a L'Artisan Parfumeur shop upstairs. Saks also has Tom Ford and I think it's the only place left in NYC you can find Killian fragrances since MiN no longer carries the brand. Oh, gotta add Cosmetic Market! It's between 5th and Madison on 37th- it's basically like AllCosmeticsWholesale.com in store form. It's a good mix of high end and drugstore makeup, and so freaking cheap. Not as fancy as Bergdorf's, but it's a lot of fun! I'd skip the Times Sq Mac store - always overcrowded and not even the best store in terms of space, products, sales associates, etc. Go for the pro store or one downtown. I would also add CO Bigelow (6th Ave between 8th and 9th) or New London Pharmacy (23rd and 8th) for hard-to-find gems if you are wandering through the general area. Macys Herald square has Inglot as well.as the huge inglot store and mixing station in Chelsea piers. They will give samples of the dozens and dozens of beautiful pigments they have in chelsea piers. Also, do get hands-on with testers for NYX - there is a store called Beauty 35, I believe, at the corner of 35th and 8th avenue. Giella for custom blending is also in Henri Bendels (about 56th and 5th). I love all the chemists/pharmacies in new york as well! Lots of bioderma, embryolisse, nuxe, institut esthederm, dermalogica, aesop,...Zitomer and Carnegie Hill just to name two in my neighborhood. I really do not suggest Bloomingdales. I've lived here 23 years and never once were they friendly at their cosmetics counters. Regardless of brand. Most recently on Friday I was at the Chanel counter to pick up a pressed powder, on a not particularly crowded day, waiting 10 minutes just to speak with someone, who brushed me aside for another woman who brought in an empty product to find something similar. Macy's really depends on the day you go, and is always, always crowded. Saks has overall been the most generous and helpful. One more thing, the beauty department in Duane Reade on 57th and 3rd is amazing. Definitely worth it.